If you would like to have a link to your web site on this page, please email the URL and a small description to info@stonesculptorssupplies.com. In exchange, we would appreciate it if you could place a link to www.stonesculptorssupplies.com on your Web site. Thank You! Frank Rekrut and Laura Thompson began their careers in the beautiful Niagara region of Ontario. In 2010 they moved to Florence, Italy where they now have a studio in the historic center of Florence where Frank’s great grandfather and great uncle were both sculptors. Please visit website at http://www.theflorencestudio.com/. Art has the capacity to provoke, soothe, inspire, delight and help us reflect on the times in which we live and the unique individuals we come to know, love and lose in its passing. FUNERIA has explored the art of memorializing those we love since 2001. Thank you for joining us in considering how art honors life—and how it will stand in for each of us when we are no longer here to speak for ourselves. Please visit website at http://funeria.com/. The California Sculptors Symposium, Inc., a non-profit corporation managed by sculptors, holds a weeklong sculpture symposium at Camp Ocean Pines in Cambria, California. The camp is nestled in a rural setting next to the ocean away from the distractions of daily life. We invite students and the general public to gain a better understanding of how sculptures are created. Please visit website at http://californiasculptorssymposium.org/. NWSSA hosts two symposia a year: Suttle Lake (Sisters) Symposium (for over 21years) in Oregon State, and Camp Brotherhood Symposium (for over 28 years) in Washington State. Both symposia offer something for sculptors at all levels. Please visit website at http://nwssa.org/. Sharon has had a love affair with carving stone for the past 40 years. 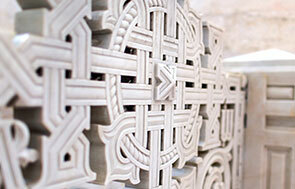 Another passion of hers is teaching people how to express themselves through stone carving. Sharon lectures and gives workshops on "Unblocking Creativity" which are based on the book. "The Artist's Way" by Julia Cameron. Please visit Sharon's website at http://www.gainsburgstudio.com/. Please visit www.thesculpturestudio.com, your source for sculpture. Check out the new horses. I am motivated by a challenge. I seek to produce art that represents a concept or triggers an emotion, but also requires technical abilities. I am predominantly a reductionist. I start from a large block and work towards the finished piece. From her studio in Arizona, this tribal citizen of the Cherokee Nation creates stone sculpture inspired by nature. Includes photographs, contact details and more. Robin Antar, President, Realism in Stone a division of Antar Studios Inc.
My passion as a sculptor involves a technique I uncovered more than 20 years ago - the precise art of creating "virtual records" of contemporary culture — capturing common, everyday items in stone. Essentially, I replicate these items on a real life-scale, complete with meticulous detail. I achieve this absolute realism by incorporating parts of the actual object, as well as custom-made stains, paints, plastics and gold leaf. It's more than art imitating life, it's art mirroring life. All Art Schools (http://www.allartschools.com) is a complete online guide to art education and careers. We strive to be the finest resource available, allowing students to compare schools, contact them, read common questions and answers, and ask questions. Karen Ryer is an very talented artist in the beautiful Russian River area in Northern California. Her new gallery is full of wonderful stone sculpture and stone-related pieces created by a variety of sculptors (including Karen of course). Please look up this charming lady at her gallery if you are in the Guerneville area. The Carving Studio and Sculpture Center. A non-profit educational organization dedicated to the creation and presentation of sculpture offering workshops, residencies and exhibitions in West Rutland, Vermont. Philippe Faraut is a professional sculptor who works in Stone and many other mediums, specializing in figurative work. Carl Berney is an experienced stone carver, his Standing Stones Studio is in rural Nambe near Santa Fe, New Mexico. Michael Binkley is an accomplished stone sculptor in Vancouver B.C. Canada who works in a variety of stone found in B.C. and Alaska. Merlin Cohen is a very experienced sculptor who lives and works in Tucson Arizona, his work is executed in marble, alabaster, steatite and calcite. Mendocino Art Center is an art center featuring retreat style workshops on the North coast of California in Sculpture, Jewelry, Fine Arts, Ceramics, Computer Arts, Textile and Young Artists' Workshops. Pool Ridge Sculpture: All works are created by father and son team, Gary and Aaron Klauenburch. Gary Klauenburch sculpts from his home and workshop on Pool Ridge in rural Sonoma County, CA. Aaron Klauenburch sculpts 35 minutes away, from his home and workshop in Forestville, CA. Bronzestone Bases: Bronzestone aims to elevate sculptured art by providing high quality bases made with granite imported from India. We specialize in polished absolute black granite, but also offer many other colors to suit any sculpture of art. The durable characteristic of the stone allow an artist to exhaust all creative processes without having to worry about its integrity.